On 8th August 1944, Michael Wittmann was declared missing in action. This is a copy of the summary note issued, providing key details and date stamped 9th October 1944. 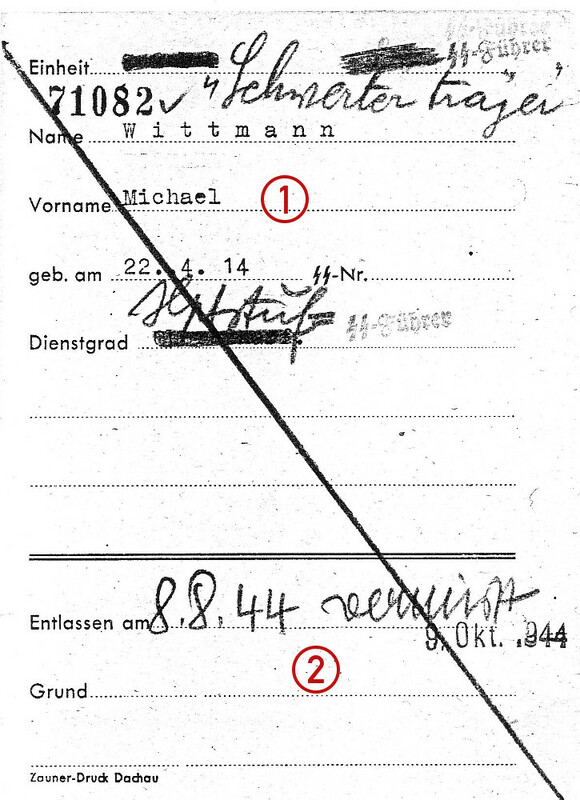 When a body was found a death notification was usually issued immediately, but as Wittmann’s body was never found by his colleagues he was listed as missing in action (Vermisst). Michael Wittmann was declared Missing in Action on 8th October 1944. This was officially confirmed two months and a day later. This is a standard form, with the core details typed and additional information written in pencil. Handwritten parts are represented in italics in the translation below. 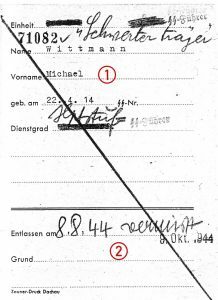 The form actually looks like a release chit, in that the term released (Entlassen am) is used in the form itself, with the word “missing” (vermisst) having to be added in pencil next to the date.